San Francisco, at night is a spectacular city full of color, light, and sound. It seems there is always something happening in downtown during the evening. It feels alive. Part of the fun of photography is capturing places in their best light...and for SF, I believe that best light is in the night. 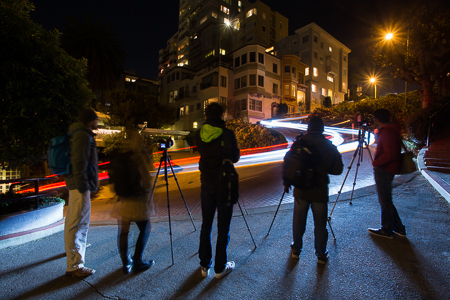 Scott Donschikowski and I met a small group of eager individuals for a night of fun exploration of San Francisco at night. After a brief orientation we set off across the bridge to Battery Godfrey. With a small group we're able to fit in a few more stops than normal, so we made our first stop with a wonderful view of the Golden Gate Bridge. 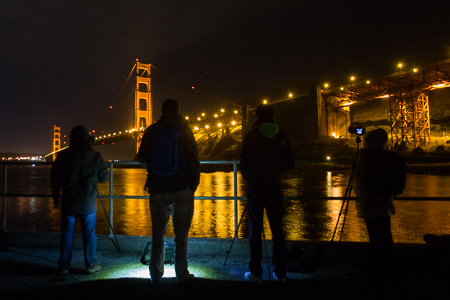 Most photographers struggle with night shooting, which is why they're out with us in the first place...so Scott and I begin to go over some of the settings and different approaches to night shooting. While we shoot, we offer up some tips on fine tuning the compositions, and making the most of the scene. 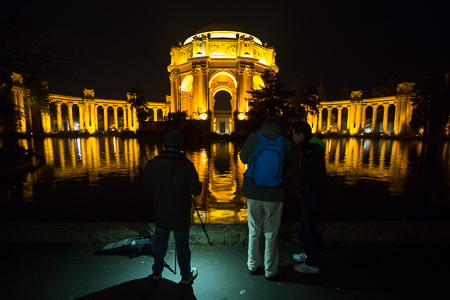 Our next stop of the night is the Palace of Fine Arts...this old WWI era building was originally erected to be a part of Panama-Pacific Exposition. Once the exposition was over, folks liked the structure so much that they built it to be more permanent. Now it's a tourist stop for everyone visiting the city. Situated on a wonderful little reflection pond, this is easily one of the highlights of our photographic journey. Scott and I explain the different challenges this location provides artistically and technically...and help the group to capture some great shots of the orange glow from the building as it reflects in the pond in front of us. No trip to San Francisco would be complete without a visit to Lombard Street. Most folks just drive the street...we get right down at street level and photograph the twists and turns. Using long exposures we're able to capture the moving streaks of headlights as they wind their way down the crooked roadway. To get the full experience we make sure we shoot from the top looking down and then move part way down the road so we can get some shots of the cars coming towards us. 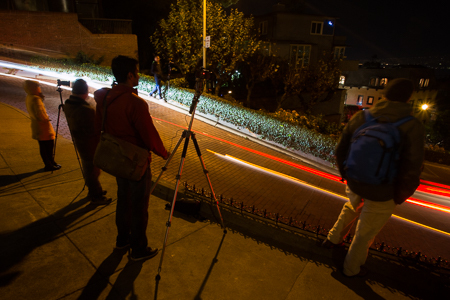 I think for a lot of folks this is where they really start to see the results of heading out to photograph at night. 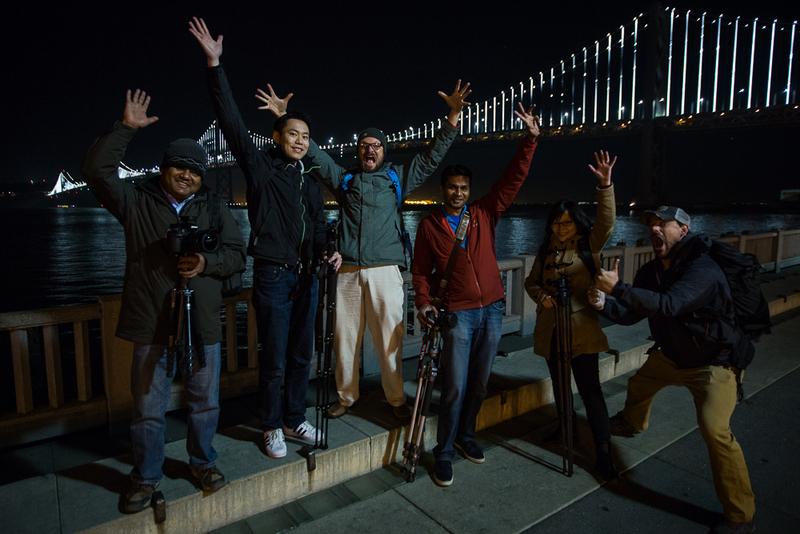 The next point of call on our night tour is the Bay Bridge from Embarcadero. This is a CLASSIC shot. If you've looked at San Francisco at night online, no doubt you've seen this image. The Bay Bridge with the old pier pilings in the foreground. The tide was as far out tonight as I've ever seen, and the pilings were towering above the waterline...which made for some dynamic foreground in our images. Scott and I helped remind the class on the settings, addressed the white balance issues this location often has, as well as offered up some minor compositional tips. The class seems to really be getting it now though, and they're mowing down images left and right...it's great to see the different takes on this spot in the backs of the cameras. All in all it was a beautiful winter night in the city, one that I'm sure our group of photographers will enjoy for weeks to come as they sift through the images they captured.